NGC 5792 is a barred spiral galaxy about 83 million light-years away in the constellation Libra. The bright red star at the lower edge of the galaxy is a red dwarf in our own Milky Way. This is in fact the most common type of star in the universe. 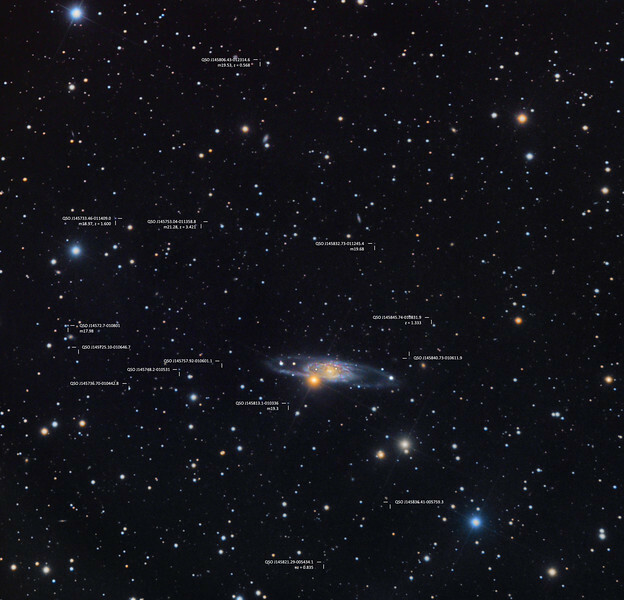 The galaxy itself is fairly dim with an overall magnitude of 12.1. Since it is relatively large in size (6'.8 x 1'.7) the surface brightness is also low. The spiral arms that originate from the centre appears to almost form a continuous outer ring around the galaxy. This structure appears similar to that of NGC 1365 in Fornax, but is seen close to edge-on here. In the distant background behind NGC 5792 a wealth of faint galaxies dot the area and even 14 quasars lie within this narrow field of view.